STANFORD, Calif. -- A touching, likely unprecedented, scene occurred today in the cutthroat world of professional tennis. 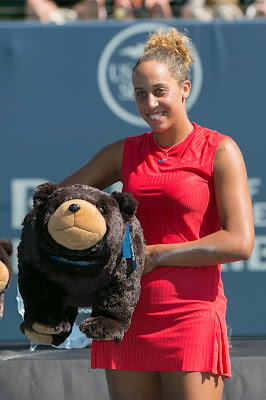 After defeating fellow American CoCo Vandeweghe 7-6 (4), 6-4 for the title in the Bank of the West Classic, Madison Keys walked to Vandeweghe's chair, hopped on her good friend's lap and hugged her. The horde of photographers, who had been aiming their cameras toward one end of the court for the impending trophy presentation, suddenly pivoted 90 degrees to capture the tender moment. Vandeweghe then walked to Keys' side of the court and sat next to her for the awards ceremony. Keys said the title "means a lot. It's my first title in the States and against a friend. Truly, I think the moments afterwards are part of what makes it so special and what I will always remember about this week." Keys and Vandeweghe became friends when they helped the United States rout host Australia 4-0 in the World Group playoffs of the Fed Cup in April 2016. "The whole team really bonded -- myself, Bethanie (Mattek-Sands), Maddie and Christina (McHale)," said Vandeweghe, also the runner-up to Serena Williams five years ago at Stanford as a lucky loser. "It was the first time really that we were all together for that long of a time because the tie (series) was in Australia. We had pretty much like two weeks together. It was a lot of fun, a lot of instances where the Australian media really did a good job in making it fun for us out there. And we won the tie, so that's a bonus of making everyone really like each other." Entering today, Keys and Vandeweghe each had won two WTA titles, both on grass in Europe. Aside from Keys' 6-3, 6-2 dismantling of top seed and reigning Wimbledon champion Garbine Muguruza in Saturday's semfinals, there was little indication that Keys would add to her total. 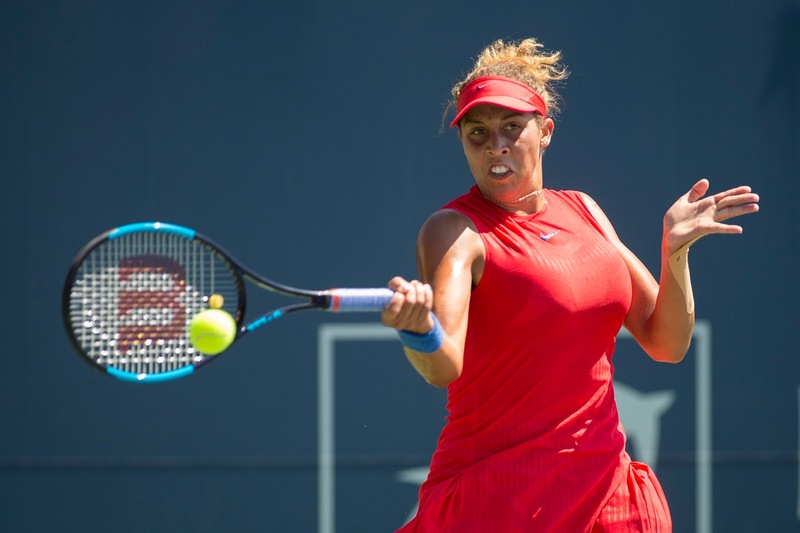 Keys, a right-hander with a two-handed backhand, underwent surgery on her left wrist last November, returned to the tour in March and had arthroscopic surgery on the wrist in early June after losing in the second round of the French Open. Keys missed the Wimbledon grass-court tune-up tournaments, withdawing from Birmingham after winning the 2016 title there, and lost in the second round at the All England Club. Keys arrived at Stanford, her first tournament since Wimbledon, with modest expectations. "I came into this tournament with the goal of having good, solid matches and trying to get consistent and feel good on the tennis court, and I think I did that," said Keys, who had lost in the second round in both of her previous Stanford appearances (2013 and 2015). "That's going to be my goal not only for the next tournament, but the tournament after that and for the rest of the season." Keys, who received a first-round bye as the No. 3 seed, trailed by a set and a break against U.S. qualifier Caroline Dolehide in the second round before prevailing 3-6, 6-2, 6-3. "I think that first match really tested me in the sense of staying composed and figuring things out and just playing smarter," Keys said. "I think that match really, really helped me for the rest of the week." Both the 5-foot-10 (1.78-meter) Keys and the 6-foot-1 (1.85-meter) Vandeweghe have powerful serves and groundstrokes. But Keys is more athletic, which is saying something considering Vandeweghe's background. Her uncle Kiki and grandfather Ernie played in the NBA. Her mother, Tauna, competed in the Olympics in swimming in 1976 and volleyball in 1984. Keys' parents are lawyers, but she chose a different kind of court. There were no service breaks in the first set of the initial meeting between Keys, 22, and Vandeweghe, 25, on a beautiful 75-degree (23.9 Celsius) day in front of an announced crowd of 2,391. Keys saved three break points, and Vandeweghe escaped a set point serving at 4-5. Keys pulled out the first set with the help of a net cord. With the sixth-seeded Vandeweghe serving at 4-5 in the tiebreaker, Keys slugged a forehand passing shot down the line set up by her ball that clipped the tape and went over the net. "I felt, in the first set especially, I was putting the most pressure on her service games," said Vandeweghe, who began working with 1987 Wimbledon champion Pat Cash at the start of the grass-court season. "I had three or four break points, and I want to say at least three of them were second serves. She came up with really good shots off those second serves, but if you look back and (say) coulda, woulda, shoulda, you're going to drive yourself crazy. Tennis is a game of millimeters, centimeters, whatever you want to call it. I looked at the end, and I think it was 72 points to 68 (correct), so there you go. That's how close it was. The only service break of the match came with Vandeweghe serving at 4-4 in the second set. Vandeweghe fought back from 15-40 to deuce but lost the next two points. Keys laced a backhand winner down the line with Vandeweghe at the net, and Vandeweghe wasted an open court by sailing a runaround forehand long. "I definitely didn't know it was over," she said, "I just knew that if I kept hanging in on my service games (during the match) that hopefully I would have a chance to break. I knew there probably weren't going to be very many opportunities, so I knew when I had a break point in that game that I really needed to step up." Keys' worries were misplaced. She held serve at love, converting her first match point with a runaround forehand passing shot down the line. Keys earned $132,380 for the title. Vandeweghe collected $70,550 as the singles runner-up and added $20,825 for winning the doubles title with American Abigail Spears. Both singles finalists rose four places in the world rankings, Keys to No. 17 and Vandeweghe to No. 20, one spot off her career high in May. During Keys' layoffs, she had doubts that she could return to the form that carried her to a career-high No. 7 in the world last October. "There was lots of times when I thought maybe it just wasn't ever going to happen again," Keys confessed. "There's lots of low moments, but as great as this week is, I don't expect my wrist to be perfect forever and never have an issue with it again. It's going to be something I have to keep up and have a really good mentality about." Keys, though, wasn't surprised to win the title. "It definitely felt like my wrist has been the final missing piece in my game," said Keys, who's coached by former world No. 1 Lindsay Davenport and Dieter Kindlmann. I've actually felt pretty good about my game for a while. It was just really good to finally feel healthy for lots of matches." Notes -- The tournament's future is uncertain following the expiration of the Bank of the West's five-year contract. The Bank of the West Classic, in its 47th year, is the longest-running women's professional tournament in the world. It has been sponsored by Bank of the West since 1992 and held at Stanford's Taube Family Tennis Stadium since 1997. Former Bank of the West champions include Billie Jean King, Chris Evert, Martina Navratilova, Andrea Jaeger, Monica Seles, Martina Hingis, Davenport, Serena Williams, Venus Williams and Kim Clijsters. --Vandeweghe and Spears, seeded third, outclassed unseeded Alize Cornet of France and Alicja Rosolska of Poland 6-2, 6-3 in the final. It was the 36-year-old Spears' second consecutive Bank of the West doubles crown and third overall. The first two came with Raquel Atawo (formerly Kops-Jones) of nearby San Jose. --Here are the complete Bank of the West singles and doubles draws. --Here are the men's $100,000 Aptos (Calif.) Challenger qualifying draw, singles and doubles main draws, and Monday's schedule. Aptos, situated on the Pacific Ocean, is a one-hour drive south of Stanford.